Finally, The Payoff In Women's NCAA Basketball The NCAA Division 1 women's tournament gets criticized for not having enough true March Madness moments. Yet sometimes the elite teams gather, as they are in Denver, in such a show of force and talent that a fan tends not to miss the little guys. 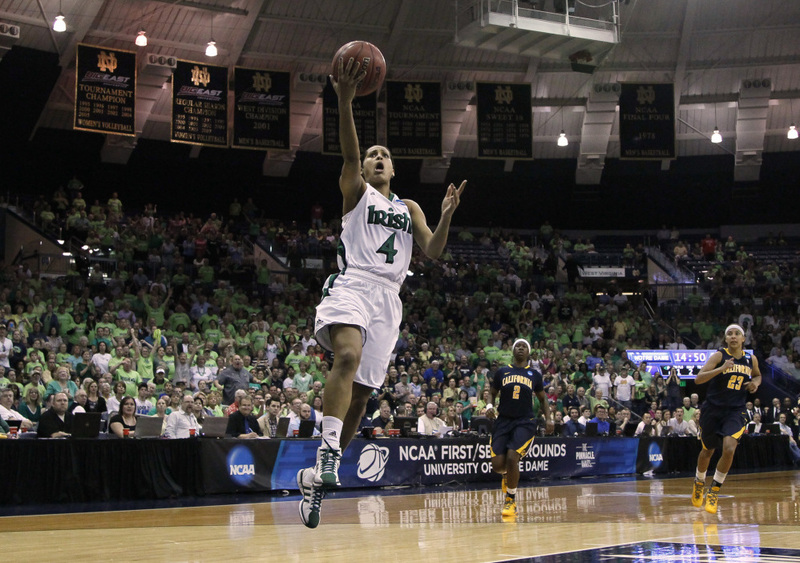 Notre Dame guard Skylar Diggins goes up during the second round of NCAA women's tournament basketball in a game against California. The NCAA Division 1 women's tournament gets criticized for not having enough true March Madness moments, when the Davids rise up and beat the Goliaths in nerve-jangling upsets. Such is the power structure in the women's game, with largely untouchable elite teams. The payoff comes when all those elite teams gather, as they have in Denver, in such a show of force and talent that a fan tends not to miss the little guys. For only the second time in the history of the women's tournament, all four regional No. 1 seeds have gathered for the Final Four. Baylor, Stanford, Connecticut and Notre Dame all have won NCAA titles. Their combined win-loss record for this season is 140-8, with those eight losses spread among three teams because the Baylor Lady Bears are 38 and 0. They've got a chance to become the first team — men's or women's — to win 40 games in a season. There are stars: Baylor's peerless Brittney Griner, a 6'8" shot-blocking and scoring machine; Odyssey Sims, the spark-plug point guard for the Lady Bears; Notre Dame's Skylar Diggins, a more complete point guard in her second straight trip to the national semifinals; and Stanford's Ogwumike sisters, senior Nneka and sophomore Chiney, a supremely skilled duo in the post. There is great defense, led by perennial power UConn with its nation's best 46.1 points per game allowed; Notre Dame with its No. 5 ranking at 51.5 ppg; and Baylor, No. 7 at 52. UConn and Baylor rank 1 and 2 in field goal percentage defense, limiting opponents on how many field goals they make. Stanford is No. 8 in that category. Finally, Notre Dame is third in the nation in steals, averaging 13 a game. And, there's incentive all around to beat last year. Baylor lost in regional play last season before the Final 4. Stanford and UConn got to the Final Four, but both lost in the semifinals. And Notre Dame, which beat UConn in their semifinal matchup, lost in the title game to Texas A&M. Chips on the shoulders for everyone. Chips plus talent plus skill equals four dynamic, hungry teams.